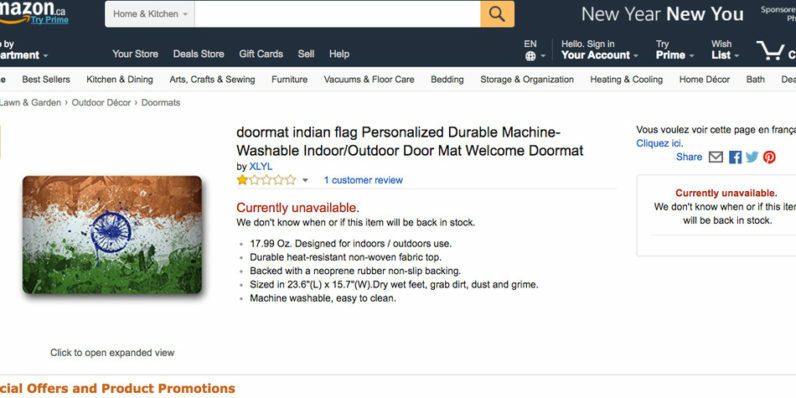 Amazon ran into a bit of a snafu on Wednesday, when the company’s Canadian storefront was found selling doormats with the Indian national flag on it. Twitter user Atul Bhobe pointed this out to India’s Minister of External Affairs, Sushma Swaraj, who demanded that Amazon – which ranks among the largest ecommerce retailers in the country – apologize immediately and remove the offensive product from its store, or potentially risk its foreign employees in India losing their visas. If this is not done forthwith, we will not grant Indian Visa to any Amazon official. We will also rescind the Visas issued earlier. While the ultimatum was harsh, it probably seemed entirely within reason to Swaraj who heads up foreign affairs in a country that greatly respects national symbols. In India, desecration of the flag in any way is a punishable offense. The trouble with this move is that Amazon has now a set a precedent in India which shows that it can be pressured to remove products from its platform this way. But is being offended enough reason to threaten to rescind visas and disrupt a company’s business? If you still feel the need to step on a flag every time you enter the house, Amazon Canada has loads of other countries’ national colors available as doormats.